On the back of its recent earnings call and bold 2019 predictions, AMD’s stock has had its best day in around three years. But Dr. Lisa Su is positive it’s not setting itself up for a fall by being so ambitious. The announcement that its 2018 full year revenue had grown 23% year-on-year, and represented a second year of double digit revenue growth, has seen AMD’s share price go up by 20% in a single day. Considering the Nvidia competition has revised its guidance down for its own upcoming earnings call, wiping off half a billion dollars from its Q4 revenue, that’s a quite remarkable performance from the red team. Especially given that Uncle Jen-Hsun saw his company’s share price drop by 15% in a single day. But some industry analysts have suggested that AMD’s 2019 outlook is maybe a little over-ambitious, or simply just “too aggressive,” as Jim Cramer says. 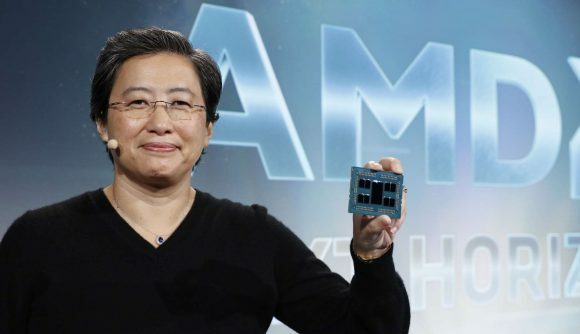 But Dr. Lisa Su, AMD’s popular CEO, has countered that opinion in an interview about the company’s earnings and its 2019 guidance figures. She suggests that while there are definite headwinds to the technology markets still driving hard throughout 2019, the fact the company has a huge range of new products releasing this year will keep pushing AMD forward, swallowing up market share, and continuing momentum. “Certainly there are some concerns about what’s going on in China… let’s not major on those things,” she says to Jim Cramer of CNBC, “let’s major on the product story. The first consumer 7nm product, the AMD Radeon VII, is going on sale next week, offering the first competitive high-end gaming GPU from the red team in a long while. But it’s the 3rd Gen Ryzen processor range, those first 7nm CPUs, that has the potential to really shake things up on the desktop side. The next-gen EPYC datacentre silicon uses the same Zen 2 architecture and will help AMD continue to eat up Intel’s server market share too. It’s that same combination of new desktop and server processors which Su says is essentially responsible for AMD’s impressive 2018. This is going to be another big year for AMD, with the promise of high-end competition in both the GPU and CPU markets, as well as the prospect of its 7nm Navi graphics cards appearing, potentially sometime around E3, and gobbling up a hefty share of the mid-range consumer GPU segment.